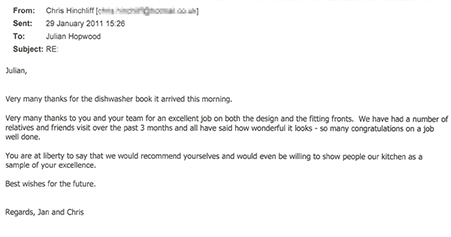 "Thank you and your staff for the quite excellent service that we received with the recently installed kitchen." "Hi Julian, Nicol and I wanted to say a huge thank you to you and the team. It was a very professional and stress free fit, with the kitchen started and finished in time for our party as promised! The customer service has been outstanding. We are very pleased with the results!" "A big thank to all the staff and team at Hadleigh Kitchens, your kitchen has surpassed all our expectations and created a new vibrant social centre at the heart of our family home, admired and sometimes envied by all The personally tailored design and superior craftsmanship, delivered with exceptional customer service has made this a platinum consumer experience." 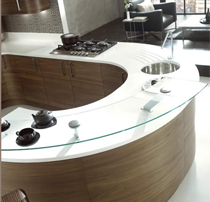 "In love with the new kitchen - style, design and wonderful appliances. The steam oven is magnificent and boiling water tap superb. A huge thank you for your first class and attentive service from start to finish."